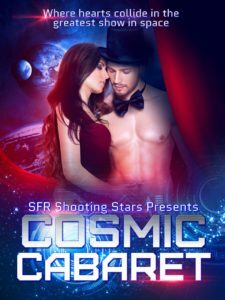 It’s October 10, and Cosmic Cabaret: Where Hearts Collide in the Greatest Show in Space has officially released. Get your copy at all major online eBook retailers for just $2.99. The price will be going up in the near future. Click HERE to buy right now for $2.99. That’s 13 sci-fi romance novellas, 1340 pages of love, soft and gentle to wildly abandoned.